Skewers are terrific because you can mix proteins with vegetables and fruits all on one cooking and serving vehicle. These can be eaten right off of the stick or removed from the skewers onto a plate. This is great party food served with plenty of napkins. Smoked skewers are good outdoor barbeque snacks. You can do a lot of these at once in your Masterbuilt Electric Smoker to feed a crowd. Double or triple the recipes as needed for more people. There are two types of skewers. Reusable steel skewers are easy to clean and store. Bamboo wood skewers are another great option. These can just be thrown away after smoking. However, it is always recommended that you soak wood skewers in water for at least 30 minutes before placing over any kind of flame. While an electric smoker doesn’t have a direct flame, there is still enough heat to warrant soaking the bamboo. We will cover three smoked skewer recipes that incorporate either protein alone or protein with other ingredients. There are seasonings, marinades, and sauces included. On this page you’ll find a recipe for smoked and marinated chicken skewers – the perfect food for summer cookouts or delicious and easy dinner. Other two skewer / kabob recipes are Smoked Seasoned Shrimp Skewers and Smoked Sweet and Sour Tofu Skewers. 1. In a large covered dish, whisk together the honey, soy sauce, sesame oil, and orange juice. Stir in the garlic, ginger, and pepper. Set aside 1/3 cup of the marinade in another bowl. 2. Cut the chicken into 1” cubes. Add the chicken to the larger portion of marinade and toss to coat. Cover and place in the refrigerator for approximately 2 hours. After 2 hours remove the chicken from the fridge and set aside to come to room temperature while you proceed to step 3. 3. Soak your skewers in water. Wipe clean the mushrooms. Leave whole the ones that are roughly the same size as the chicken. Large mushrooms can be sliced in half. Slice the pepper in half and remove the seeds, pith, and stem. Cut the pepper into roughly the same size pieces as the chicken. 4. Remove 1 or 2 racks from the smoker to place the skewers on. Prepare your smoker by adding wood chips to the tray and water to the bowl. Preheat the smoker to 250°F. Open the top vent. 5. While the smoker is heating up, assemble the skewers. Start with chicken, then bell pepper, then mushroom and keep going in that order until the skewers are assembled and placed on the rack. Spoon any leftover marinade that the chicken was in over the skewers and discard the rest, except for the portion that was put aside. Place the rack inside the smoker and cook for 30 minutes. Rotate the skewers and cook for another 30 minutes. At 60 minutes check the wood chips and water. Replenish as needed. 6. At 75 minutes brush or mop the skewers with the reserved marinade (not the one that was in contact with raw chicken). Rotate and brush again until all the marinade is used. Smoke the skewers for another 15 to 20 minutes or until the internal temperature of the chicken is at least 165°F to 170°F. 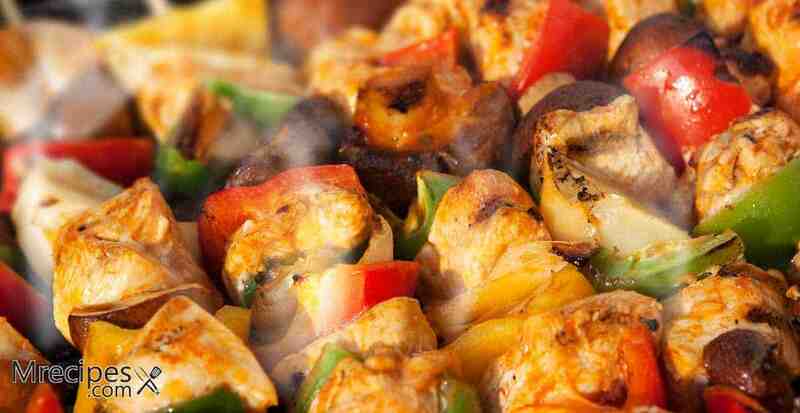 Serve the skewers with plenty of napkins or remove the chicken and vegetables to a platter and serve with cooked rice. Also check out Smoked Seasoned Shrimp Skewers and Smoked Sweet and Sour Tofu Skewers recipes.